Test the Remarkable Powers of this Amazing Booklet - free! "Only through wisdom can one scale the highest mountains." Unlock the power of your inner mind with the words of the Ascended Master Rim Kappoche. Become more successful, gain confidence, overcome your frustrations, lose weight, cure hiccups, find your car keys and regain health! 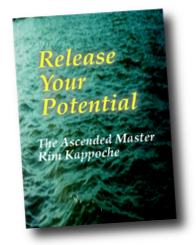 The irresistible power of the Ascended Master's teachings will help you release your extraordinary powers of personal development. "Only with courage can you reveal your whole."